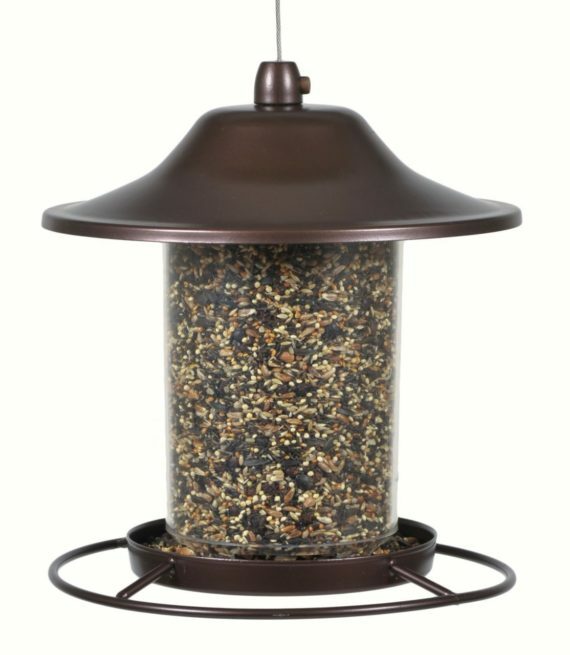 The Perky-Pet Small Panorama Wild Bird Feeder is sure to attract many birds to your backyard. The innovative design of this feeder allows the seed to dispense into the tray and stops dispensing once the tray is full. As the birds continue to dine from the circular perch, the seed is replenished into the tray so it remains consistently full! Perky-Pet is a registered trademark of Woodstream Corporation, a large privately held company producing a plethora of helpful tools for backyard bird watching, animal control and fencing. Woodstream Corporations has worked in the wildlife products environment for over 150 years. Woodstream Corporation is headquartered in Lititz, Pennsylvania and has eight other offices in The United States, Canada, The United Kingdom and China. The company began building mousetraps and expanded from there. A worldwide organization, built on mousetraps--imagine that! The Perky-Pet brand began in 1958. That’s nearly fifty years of excellence and innovation feeding backyard birds. Perky-Pet is, perhaps, best known for their Hummingbird feeders which are as beautiful as they are functional.